Primers are essential for a perfect base. But many people tend to ignore it, which makes their makeup base patchy and cakey. 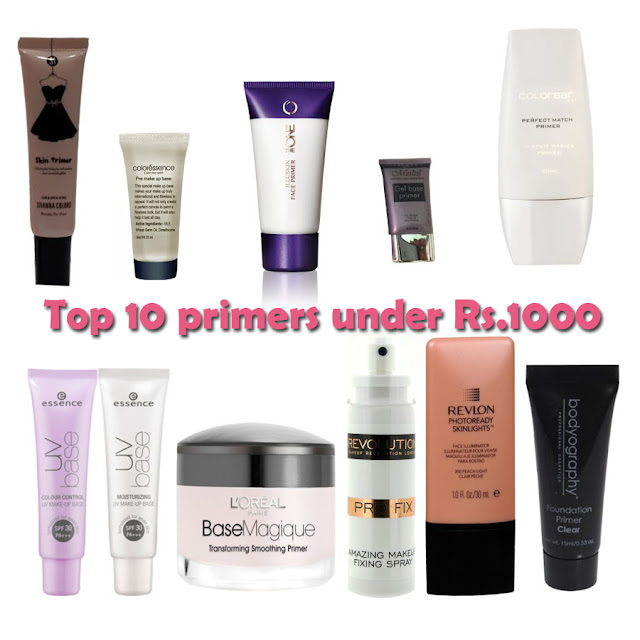 Many different primers are available in India but I wanted to list down 10 primers which are budget friendly as well as worthy. So here are the list below starting with the primer with lowest price. 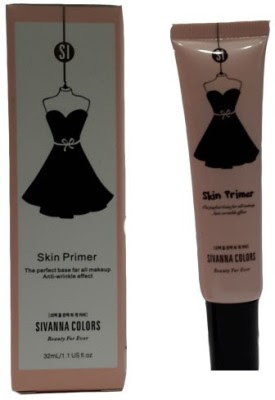 This primer is the cheapest primer available in the Indian market. It leaves the skin moisturized unless you have dry skin. Their is slightest hint of shimmer in it so it will make your skin glow. The product is very light and spreads easily. It smooths the skin amazingly. "You have your friend’s birthday party during the weekend and you are wondering what to wear to create that lasting impression. You have picked up a blue cocktail dress and the perfect stilettos. Everything is planned perfectly except for the way you going to apply makeup. All you want is to look like a diva till the end of the party, the only way your makeup can last till the end of the party is with this Foundation Primer from Bodyography. Perfectly designed for women, this Clear Shade Foundation Primer will give you that radiant look. The Bodyography Foundation Primer is enriched with ingredients like green tea, grape seed extract, vitamin A and E.
Also, green tea will treat the acne on your skin. Grape seed extract will leave your skin hydrated. Vitamin E will add the accurate amount of moisture to your skin. Besides giving you that even skin tone, this Bodyography Foundation will fill in fine lines and wrinkles. This Primer will not irritate your sensitive skin and will keep your foundation fresh throughout the day. Additionally, this Foundation will prevent collagen breakdown and is safe for under eye usage. You can apply this oil-free Bodyography Primer under wet and dry formulas and look stunning." 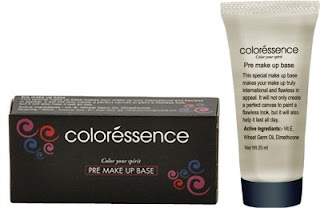 This is the best primer you can get under Rs. 500 because it increases the longevity of your make-up up to 7 hours. Essence is a well known brand. It produces quality products which are budget friendly. The product claims : "skin perfection at its best: the new moisturizing make-up base provides skin with intensive moisture and ideally prepares it for foundation. the light formula doesn?t weigh down the skin and offers the top level of protection against sunlight and tanning with SPF 30 as well as PA+++. the base is free of oil and is therefore optimally aligned with the needs of asian skin. for a pleasant feeling on the skin and a fresh complexion ? all day long"
It is worn or under the makeup base to increase longevity of the make up.an oil free product which helps to reduce the appearance of fine lines&pores. It minimizes Pores and Eases Fine Lines, Long Staying Power, Crack-proof. Discover the secret to perfect skin texture. 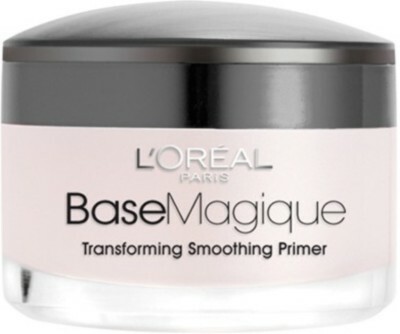 Introducing Magic Perfecting Base for instant smoothing results. Get the perfect skin texture, instantly and all day. The silky, lightweight formula glides onto skin and minimizes the look of pores and fine lines. Skin feels smooth to the touch. The result-a unified matte finish that's flawless. Even your skin tone, and illuminate your face with a radiance that banishes any dullness by using this Peach Light face illuminator from Revlon Photoready Skinlights. The photochromatic pigments and light-capturing crystals in this primer bend and reflect light and lend an instant glow to your face. The thin, runny texture is lightweight on the skin, easy to spread and works wonders to seal visible pores and minimize other flaws. This a multi purpose product. It primes, sets and fixes your makeup base. You can spray it before applying foundation to allow it to act as a primer, and you can use if after you are done with your makeup to set your base. This reduces the cakey-ness. I have acne scars on my face and want to hide my large pore acne scars with primer or foundation could u please suggest me which one is the best to hide scars and from where I can buy the product. 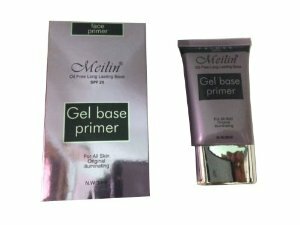 Hello I have very dry skin ..Confused which primer to buy for very dry rough skin...I am just a beginner...Pls let me know your view..